I’m pretty excited to say that today marks the 2-year anniversary for Chalk and Notch Patterns! 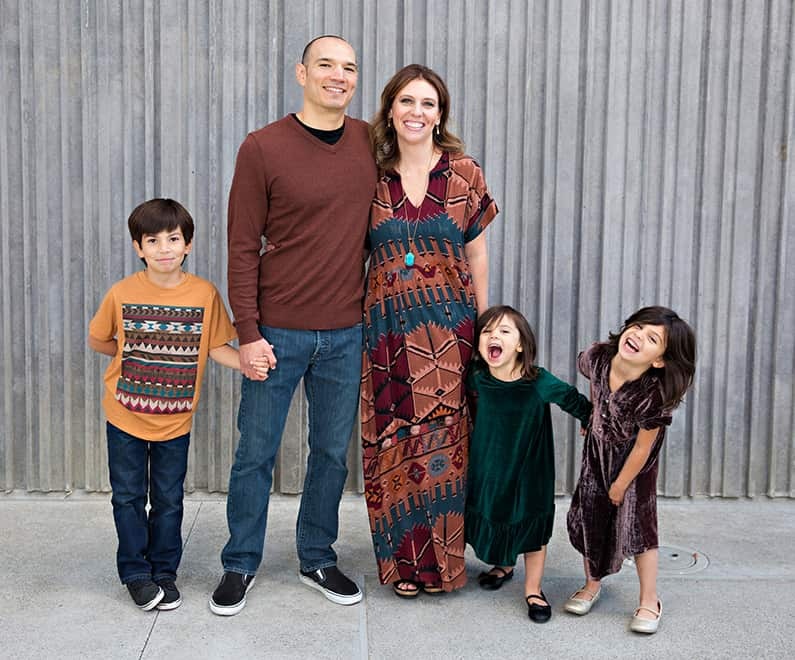 Starting Chalk and Notch has allowed me the freedom to create a business that works for my family life. I was honestly worried that after leaving the apparel industry my practical skills wouldn’t translate to another career. It’s been such a pleasure to use my pattern making education and industry work experience to bring PDF patterns to the home sewist. It feels like exactly what I was meant to do. 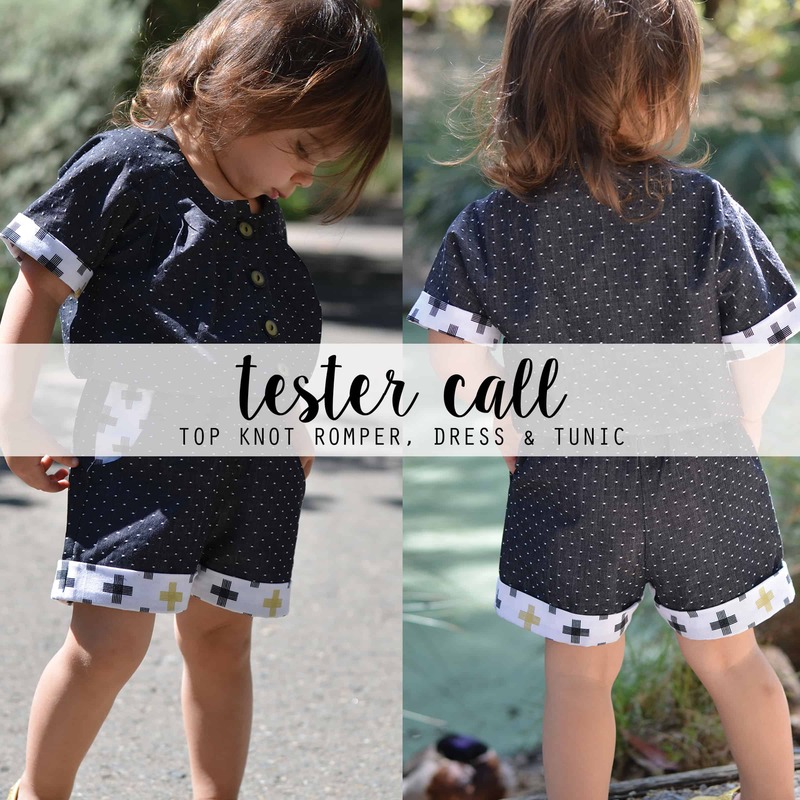 I launched Chalk and Notch patterns with the Girls’ Fishtail Kimono. Seeing this image of my daughter is a big reminder of the time that has passed. 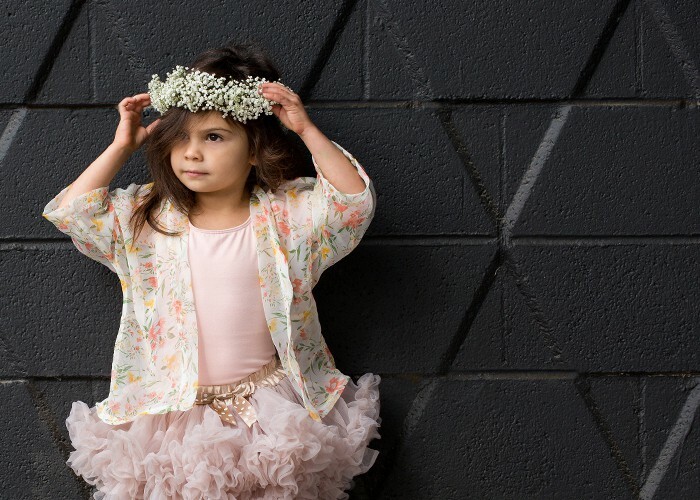 The intention was to focus on girls’ patterns mostly because of scale and ease of fit. However, 2 years later my pattern library has grown to 8 patterns with a new focus on women’s patterns. My customers seem to enjoy women’s patterns more and I have enjoyed developing them. I have learned so much while creating this business; it’s been a ton of work and many sleepless nights. I’m proud of Chalk and Notch, and I’m excited to see where it will take me. What I didn’t expect to find was the wonderful indie sewing community. The support and friendships from bloggers, Instagrammers, testers, fellow designers and indie fabric shops have been the best reward over the last 2 years. It’s been amazing to be part of this community of makers! 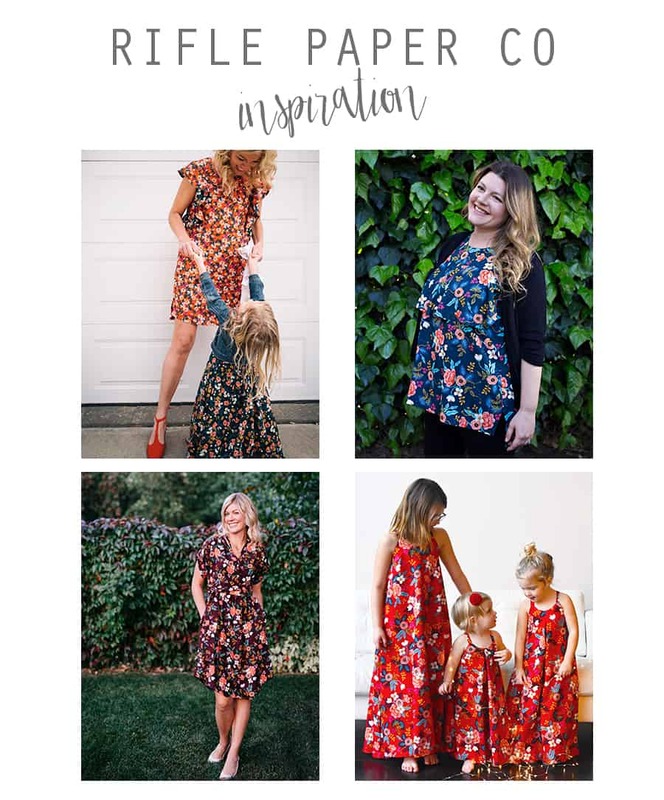 I’m currently developing patterns for 2018 and preparing for the holidays with my family, who have been my biggest cheerleaders and hopefully, my future employees. We had family photos this past weekend with our talented friend and official photographer of Chalk and Notch, Martia Madeloni. We got loads of good pics showing an accurate picture of our kids’ personalities! Holiday photos have always been great motivation to sew our holiday outfits early (well at least for us girls). I sewed a Maxi Fringe Dress in a tribal rayon crepe fabric from Style Maker Fabrics. I loved this fabric when Kelli made the Winslow Culottes for the Fall 2016 Style Makers Tour. The drape is so soft I thought it would work for a Maxi Fringe Dress and as an alternative to a more traditional holiday print. I will say I had some unfortunate pattern placement, but I was able to remove that part of the print by adjusting the darts. Honestly, lately it’s always been something when sewing, even when I am sewing a pattern I have sewn so many times, but I guess that’s just how it goes sometimes. I’m so glad I was able to make this dress work since it was just what I was picturing and I really love how it turned out. If you are interested in making a Maxi Fringe, you can check out the Maxi Tutorial in this post, which includes downloadable instructions. 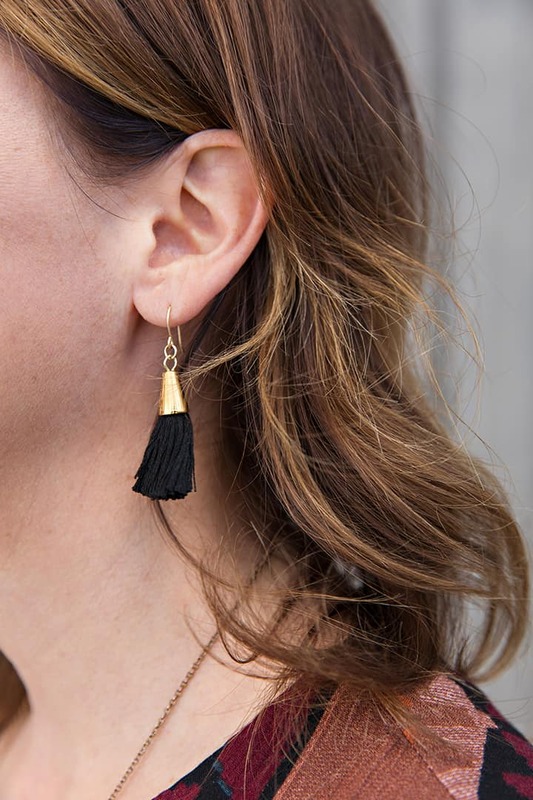 When thinking about styling this dress I thought of these Natalie Borton Bridget tassel earrings that I had been eyeing for a while. 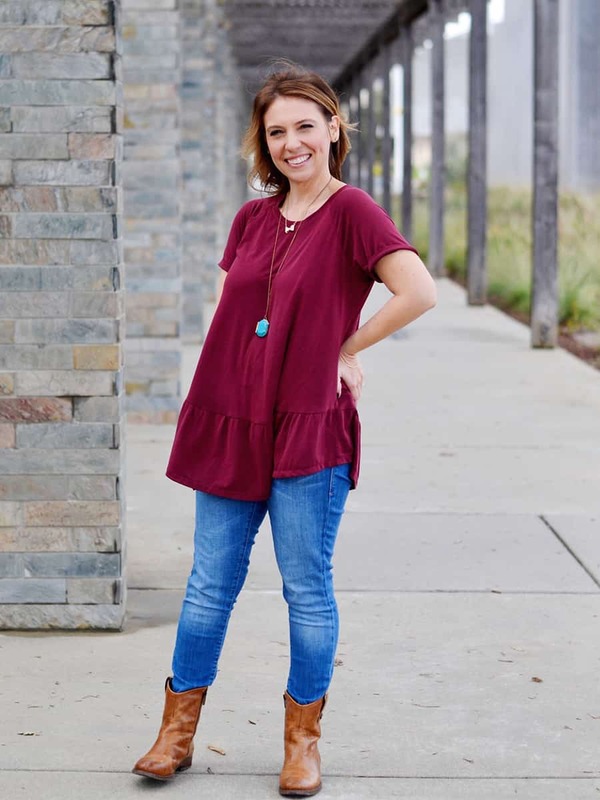 They are fun and festive for the holiday, but still simple enough to style with a variety of outfits. The quality is great and I’m so happy I finally bought them. 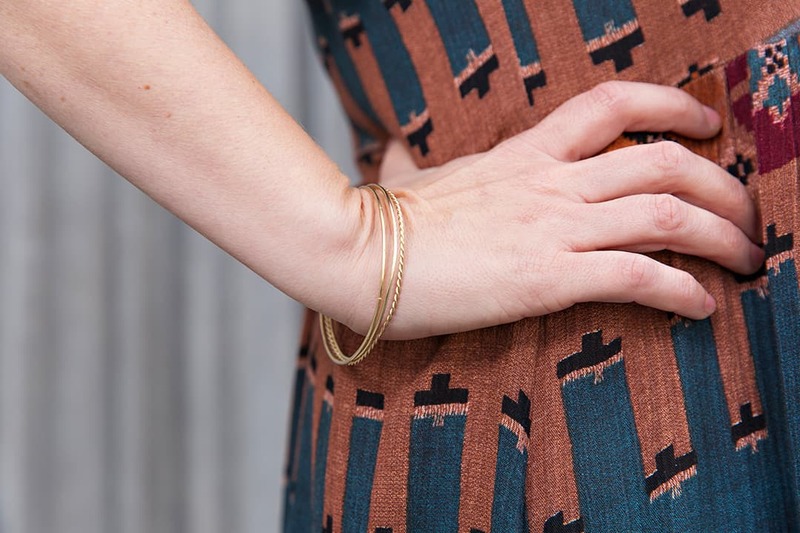 I also paired this dress with my Evermore Co. bangles that I wear every day. I love the tradition behind this company, and the craftsmanship is beautiful. Wearing these handmade pieces feels really special. They would be an awesome gift to give or receive this holiday season. 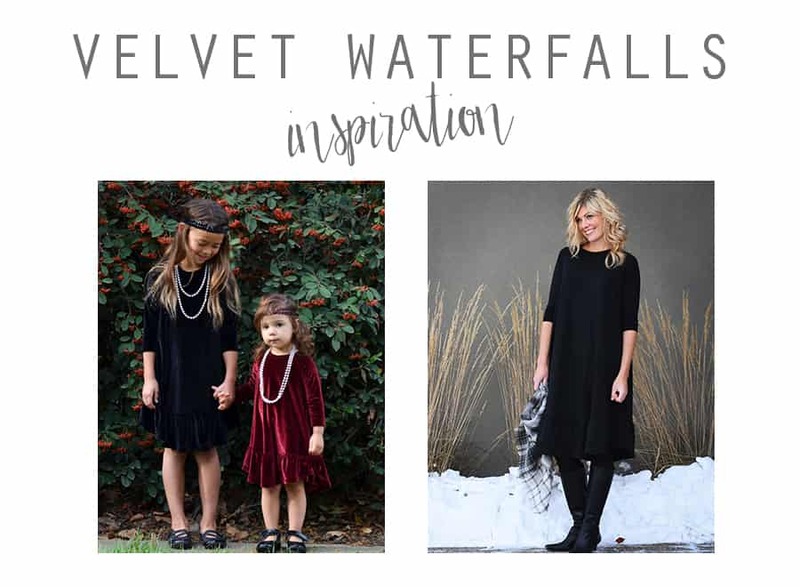 For my girls, I knew I wanted to use velvet for their holiday dresses. I had both of these fabrics in my stash. After seeing Emi’s fantastic Mini Fringe, I had to try to make one for my daughter as well. I did this by scaling down the smallest size and then testing it and making fit adjustments. Certainly not what I would do for production (I would start with a child block), but it worked in a pinch. After I posted Emi’s photo on Instagram I started to receive a few requests for a Girls’ Fringe. I hadn’t planned on it but if there is enough interest, I could, so let me know your thoughts on that. The chocolate brown velvet is woven and has a vertical crushed texture. I sewed a Waterfall Raglan for my youngest in an emerald green knit velvet and it was an instant hit. Both gold and black ballet flats were from Target, purchased right before we took these pics because that’s how it always goes. So for the fun part! How about joining me in celebrating Chalk and Notch’s 2-year anniversary and sewing for the holiday season? For a little added holiday cheer, I’ll be hosting an Instagram giveaway along with Style Maker Fabrics. 1. Post a photo on Instagram of your holiday make between now and November 27th (extended). You do not need to be using a Chalk and Notch pattern or fabric from Style Maker Fabrics; just join the fun and share your holiday makes for your chance to win! This giveaway is open internationally. Three winners will be chosen at random by November 28th at 8pm (PST), each winning one of the prizes below. Michelle of Style Maker Fabrics has just loaded her site with so many awesome holiday fabric options. I have paired them with some Chalk and Notch patterns to inspire you to get planning and sharing! First up is the Waterfall Raglan. I love this pattern in velvet and the velvet trend is still going strong this year. Check out all of the jewel tone velvets available at Style Maker Fabrics, HERE. Like most of the sewing world, I am a huge fan of the collaboration between Rifle Paper Co. & Cotton + Steel, and any pattern looks great in this fabric. The weight and quality of the rayon is a great choice for any holiday garment. The credit goes to Jill of Kneesocks and Goldilocks for the inspiration since she makes this fabric look amazing. Style Maker Fabrics has many of the fabrics from this collaboration, along with lots of beautiful rayon options, HERE. Patterns pictured are the Farrah, Fringe & Cascade Maxi. You could also try one of the many metallics or special occasion fabrics at Style Maker Fabrics. I think a sequined Pony Tank Top or Dress would be so pretty! I found the image on the left on Pinterest without a source, but it gives a similar Pony Tank vibe. 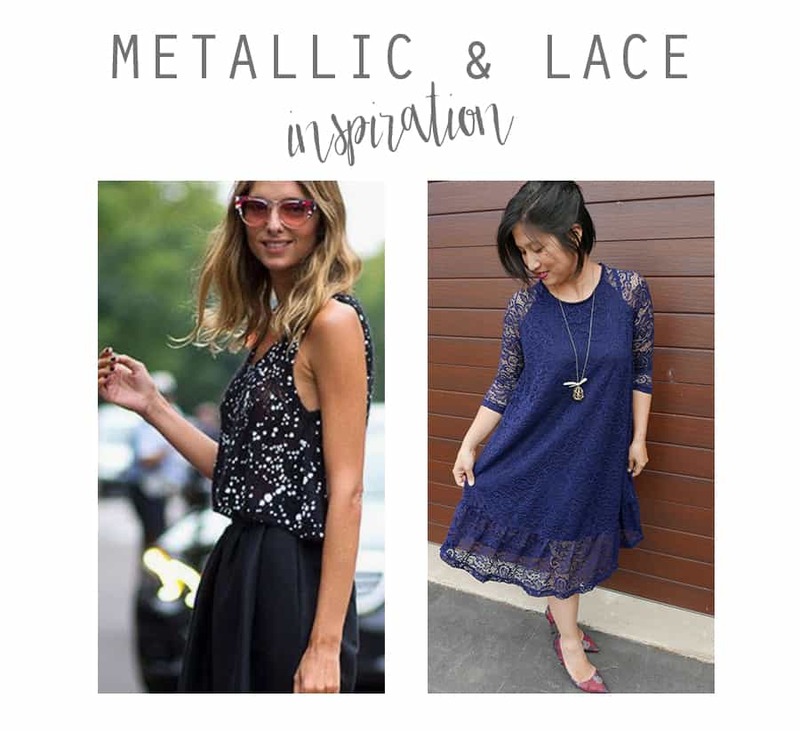 I also love this lace Waterfall dress that Thao of Little Cumquat made. The sheer lace sleeves and ruffle are so pretty in stretch lace. Both of these options would be such a lovely holiday party outfit! I hope you feel inspired to join us in celebrating our 2-year anniversary and share your holiday sewing with us! Love all your dresses! I have a fringe maxi planned for Christmas and fabric is on the way. I’m crossing my fingers that my idea will work out! Also, I would love a girls fringe dress pattern to make for my sisters! Such a great post! Happy 2 years and can’t wait to see what’s in store for your future. Love ya friend!